PROSPECT provides clinicians with supporting arguments for and against the use of various interventions in postoperative pain based on published evidence and expert opinion. Clinicians must make judgements based upon the clinical circumstances and local regulations. At all times, local prescribing information for the drugs referred to must be consulted. Grades of recommendation (GoR) are assigned according to the overall level of evidence (LoE) on which the recommendations are based, which is determined by the quality and source of evidence. 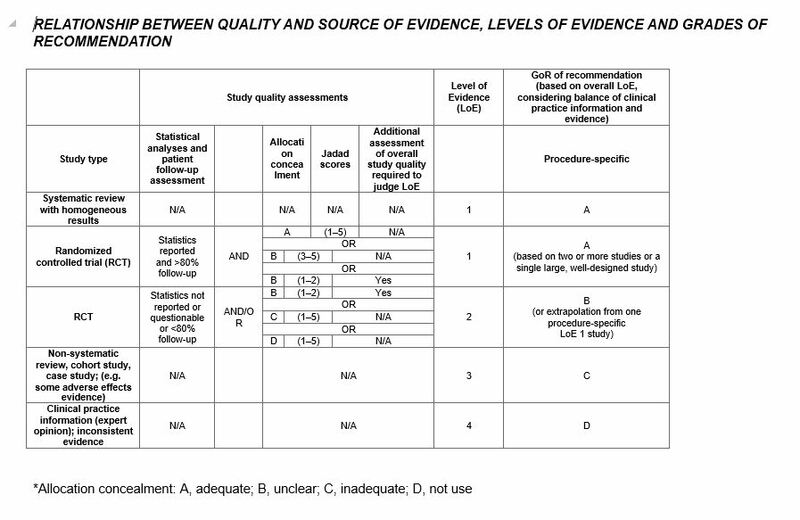 An explanation of how study quality assessments are performed to determine the LoE and GoR can be found at the following link: Relationship between quality and source of evidence, levels of evidence and grades of recommendation. A combination of local anaesthetic and opioid is recommended (GoR A) because of the increased analgesic efficacy of the combination compared with either drug alone. It is associated with an increased risk of hypotension and bradycardia (GoR D). Conventional NSAIDs Pre-operative administration of these agents can increase the risk of intra- and postoperative bleeding (GoR B). Corticosteroids for analgesia Procedure-specific evidence shows no significant benefit in reducing pain scores (but they may be used for reduction of PONV). (GoR A). Continuous administration of IV lidocaine limited to the pre-/intra-operative period GoR D because of inconsistent and insufficient procedure-specific evidence. NMDA receptor antagonists GoR D because of limited procedure-specifc evidence. Calcium channel antagonists Limited procedure-specific evidence showing a lack of postoperative analgesic effect. (GoR B). Spinal morphine Due to the risk of side effects. (GoR D). Spinal clonidine Based on procedure-specific evidence showing limited analgesic effect and the risk of side effects. (GoR B). Pre-operative use of guided imagery Due to limited procedure-specific evidence (GoR D). Laxatives for analgesia Limited procedure-specific evidence shows no analgesic benefit (but they may be used for reasons other than pain relief) (GoR B). Pentoxifylline Due to limited procedure-specific evidence of its analgesic effect (GoR D). Bilateral TAP block Due to limited procedure-specific evidence (GoR D). COX-2-selective inhibitors (GoR B) (only if not received preoperatively, and for patients who do not receive epidural anaesthesia). Opioids (GoR B) (only for patients who do not receive epidural anaesthesia). Continuous administration of pre-/intra-operative IV lidocaine if continued during the immediate postoperative period, when epidural analgesia is not feasible or contra-indicated (GoR B). Continuous thoracic epidural anaesthesia and analgesia, at a level appropriate to the site of incision are recommended for routine use (GoR A). 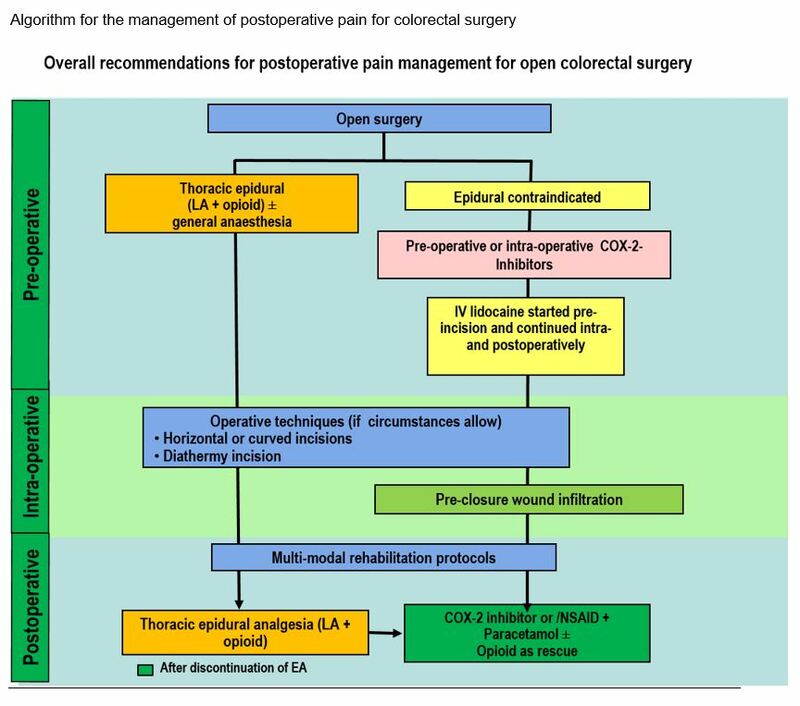 The decision concerning the type of operative technique or incision to use for Colorectal surgery should be primarily based on factors other than the management of postoperative pain, e.g. malignancy versus benign disease operative risk factors of the patient, risk of wound infection, and availability of surgical expertize (GoR D). Horizontal/curved (transverse) incision is recommended over a vertical incision for analgesic and other benefits if the operative conditions allow (GoR B). In addition, the horizontal/curved incision is preferred for its cosmetic benefits (GoR D). Diathermy is recommended over the scalpel (GoR C). Maintenance of normothermia is recommended for improved clinical outcomes, but it is not helpful for reducing postoperative pain (GoR A). IV clonidine It is associated with an increased risk of hypotension, sedation and bradycardia (GoR D). Calcium channel antagonists Based on limited procedure-specific evidence showing a lack of postoperative analgesic effect (GoR B). Gabapentin/pregabalin Due to a lack of procedure-specific evidence (GoR D). Continuous administration of IV lidocaine limited to the pre-/intra-operative period Due to inconsistent and insufficient procedure-specific evidence (GoR D). NMDA receptor antagonists Due to limited procedure-specific evidence of analgesic efficacy (GoR D). Opioids In patients receiving epidural analgesia (GoR D). Addition of clonidine to the combination of epidural LA + opioid Due to side effects (GoR D). Spinal analgesia in combination with epidural anaesthesia Based on a lack of benefit in reducing postoperative pain in Colorectal surgery (GoR B). Conventional NSAIDs (GoR A) (only for patients who do not receive epidural analgesia or with cessation of epidural analgesia). IV lidocaine (GoR B) (when epidural is not feasible or contra-indicated). Opioids as rescue if non-opioid analgesia is insufficient or contra-indicated. (GoR B). Paracetamol (GoR B) for moderate- or low-intensity pain (only for patients that do not receive epidural analgesia, or after cessation of epidural analgesia). Continuous thoracic epidural anaesthesia and analgesia at a level appropriate to the site of incision (GoR A). Evidence is insufficient to recommend TAP block but TAP blocks can be considered for acute pain relief after Colorectal surgery when epidural anesthesia is not possible (GoR A). Continuous pre-peritoneal infusion of LA, as an alternative when epidural analgesia is not feasible or contra-indicated (GoR B). Care protocols (which include controlled rehabilitation with early ambulation and diet, or multi-modal optimisation programmes) (GoR A). NMDA receptor antagonists Due to limited procedure-specific evidence of analgesic efficacy(GoR D). IM strong opioids GoR D.
Mechanical massage with aspiration of abdominal wall Further supportive data are needed (GoR D). Nasogastric tubes They are associated with discomfort and inconvenience and do not decrease the duration of postoperative ileus (GoR A).